Using beautiful coins in jewelry is definitely one of our favorite custom projects in our jewelry shop. First, I have to find the authentic beautiful coin. This is a really hard task because there are many counterfeit coins represented as authentic. I have learned over the years that the only coins we buy and offer to our clients are from reliable sources and are certified by the Numismatic Guaranty Corporation (NGC). NGC is an internationally recognized company that does thorough testing of the coins to assure their authenticity. Each ancient coin that I send to NGC comes back embedded in a plastic shell with an inserted label identifying the coin. As stated on the NGC website, “NGC offers the industry’s most advanced coin holders in a range of sizes to fit virtually every coin ever struck. Designed for long-term preservation and protection, the NGC holders are comprised of high-quality inert materials and include numerous security features.” When buying a special ancient coin, that could be over 2,000 years old, it is very disheartening to find out they are fraudulent. With the assurance of NGC, you know you are buying the authentic article. I have also over the years, found a couple of trusted individuals that I buy from on a regular basis. I am presently in search of a couple of outrageous coins to make a new men’s ring and ladies earrings. Hopefully the right coins will be found in the next couple of months, so we will have these pieces available for the holidays. Here are three pieces of coin jewelry that we have in stock. Each of these are true treasures. 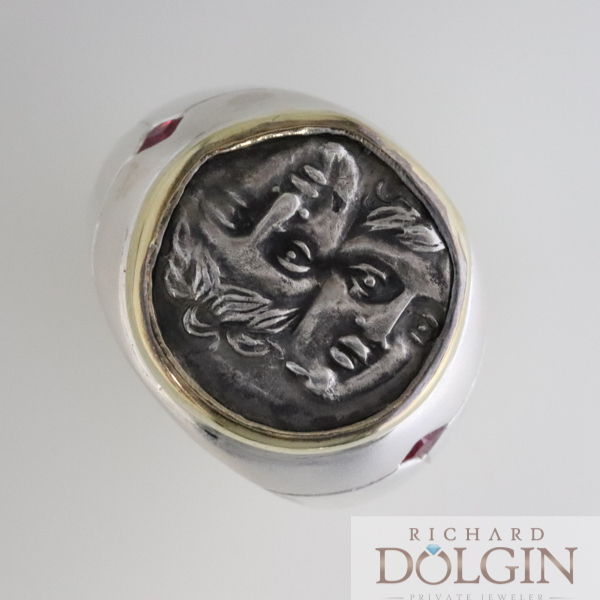 We created this first ring using a Greek Drachma coin know as "Moesia, Istrus". This coins is from the 4th Century B.C. It features two young males with their heads side by side, representing the duality of life. Most believe they are the twins Castor and Pollux. The reverse side of the coin has a dolphin and sea-eagle. For this ring we used an 18k yellow gold bezel following the contours of the ancient coin, with a sterling silver shank. We set two gorgeous princess cut rubies in the shank. We also created a beautiful pendant with a coin that matches the coin in the gents ring we just described. The pendant is 14k yellow gold, with hand wrapped white gold wire. The third piece we presently have in stock is a pendant from Mel Fisher’s Treasures. 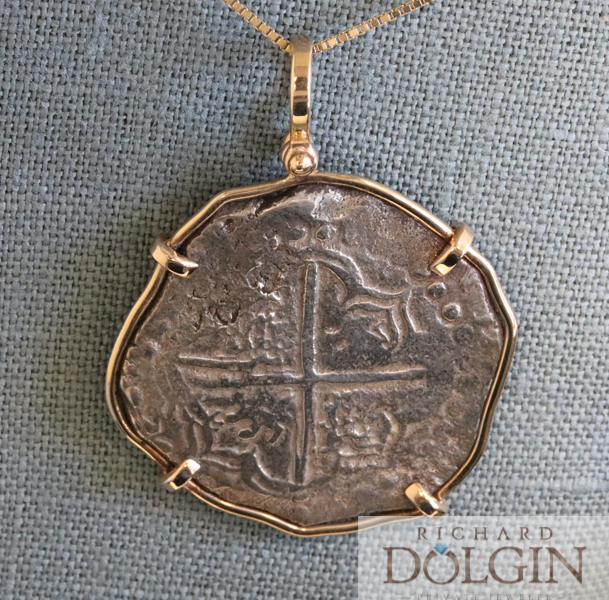 This pendant feature an 8 Reales recovered from the shipwreck of the Nuestra Senora de Atocha in the Florida Keys. This coin is from the reign of Phillip III (1598 - 1621). The coin features a simplified Hapsburg Shield on one side a cross with castles and lions in the quarters on the reverse side. Here are some image of these custom coin jewelry pieces. Over the years we have acquired ancient coins and transformed them into beautifully unique bracelets, earrings, pendants, rings and cuff-links. 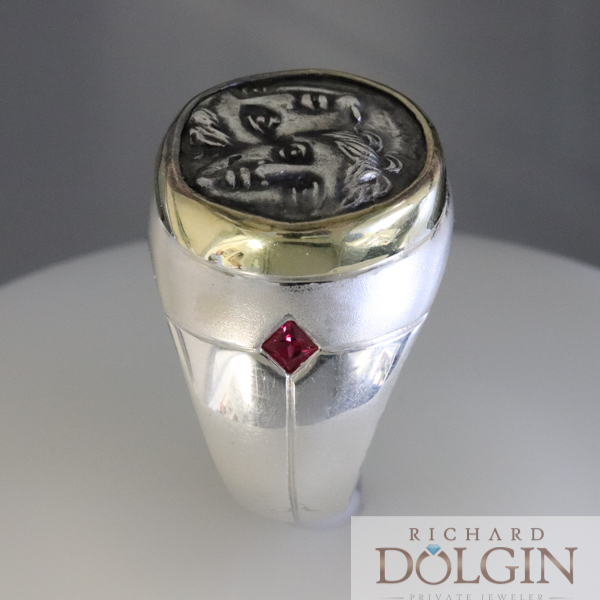 If you are interested in coin jewelry contact us at Richard Dolgin Private Jeweler in Overland Park, Kansas and we will help you with your coin jewelry treasure.